What are possible Wikipedia assignment designs? In comparison to editing a private class wiki, Freire & Li (2016) found students who engaged in a Wikipedia assignment showed improved writing quality, more balanced discussions of the issues at hand, and included greater number of primary sources. Overall, Wikipedia assignments can support learning related to intended outcomes such as writing & communication, critical thinking, and information literacy. But what are the possibilities for assignment design? And how do instructors incorporate Wikipedia assignments without overburdening their students or themselves? Translate an Existing Article: There are nearly 3x more English pages on Wikipedia than French, 4x more English than Spanish, and 6x more English than Chinese. In a translate assignment, students straddle the language gap to translate high-quality articles from one article to another language. Create new media: Wikipedia pages can be text heavy. There is incredible value added to a page when other forms of media are added. In a media creation assignment, students produce original media content for upload. How do I get started with Wikipedia Assignments? 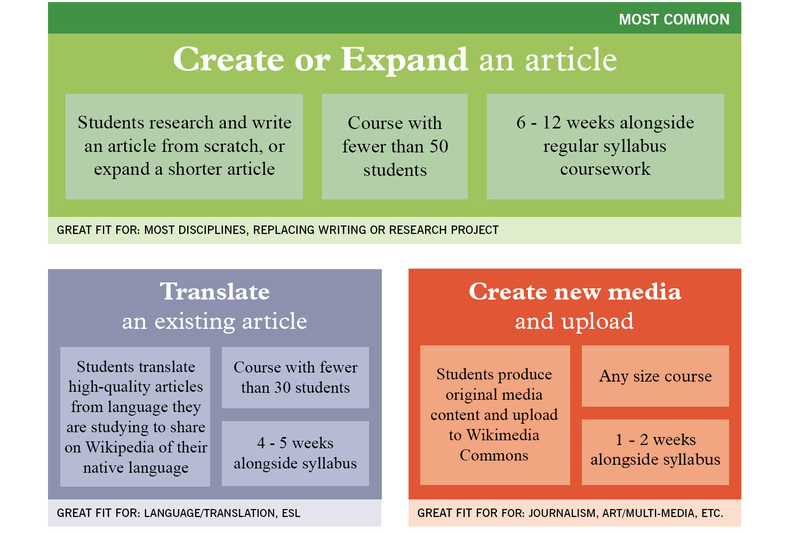 Wiki Education offers a Dashboard tool that supports instructors to develop their Wikipedia assignments (with helpful supportive materials designed by Wikipedia Education themselves). Further, the Dashboard serves as an assignment management system where students are supported to become familiar with Wikipedia pages through scaffolded tasks, and where they access all the details required for successful completion of your assignment. The Dashboard allows instructors to track and manage student progress, making it easy to provide feedback and grade work. To get started with the Wikipedia Education Dashboard, visit their site.